So, here we begin with the first section, i.e, the brief introduction of Angular and Vue. Backed by Google, Angular is an open-source framework considered for building dynamic websites and applications. The framework falls under the category of MEAN stack and is supportable with a wide range of code editors. Whereas, the answer to what is Vue is that it is an open-source framework created by Evan You for tackling the challenges associated with Angular and React JS frameworks. The framework is highly recognised in the market for developing a simple page web application. Angular JS framework offers better Server-Side Rendering (SSR) features that improve the page speed on the client side. This makes the JS framework more SEO-friendly. Angular follows the MVC model, which makes it good for separation of concerns and cleaner faster development. The framework provides developers with an extensive linking module for single page app development that assists in understanding of how Ajax works and introducing its advantages into your app project. Last but not least, the Angular framework makes it possible to easily blend various tools and filters into the development environment. This delivers a high-speed front-end experience. The Angular IO framework comes with advanced refactoring and debugging options that aid developers in the testing and maintenance process. Besides, it renders the opportunity to test the complete project with a single testing tool like Jasmine, Karma and Protractor. This cut down the hassle of developers and ensure highly-effective results. As we have already seen in our article React vs Angular covered a few months ago, Angular CLI is easy to install and use. It also serves mobility experts with simpler commands and effective testing tools and is supported by several engineers and platforms that make it possible to update all the app components – including those having dependency on third-party libraries and APIs. While these features favor choosing Angular for front-end development, it’s good to have a glance at the benefits of Vue.js to determine what to consider in Vue.js vs Angular to do justice to your app needs. An app developed using Vue.js framework can be as light as 18Kb after zipping. This makes it the first choice to target the user base demanding for low memory consumption with impressive features availability. Since the app size is minimal, the Vue.js – based application is faster to download and employ. As specified earlier in our Vue.js vs Reactjs article that was covered last year, Vue.js facilitates a simpler and easier integration process. This makes it developers’ favorite to build both single page application from scratch and integrate high-end components into an existing one. Just like Angular frontend development framework, Vue.js also offer the option of Server-side rendering. This improves the speed of the working of pages on the client end, which eventually result in better user experience. But as disclosed by GitHub, while Vue is getting higher stars and forks, it is lagging behind in terms of the number of commits and contributors. 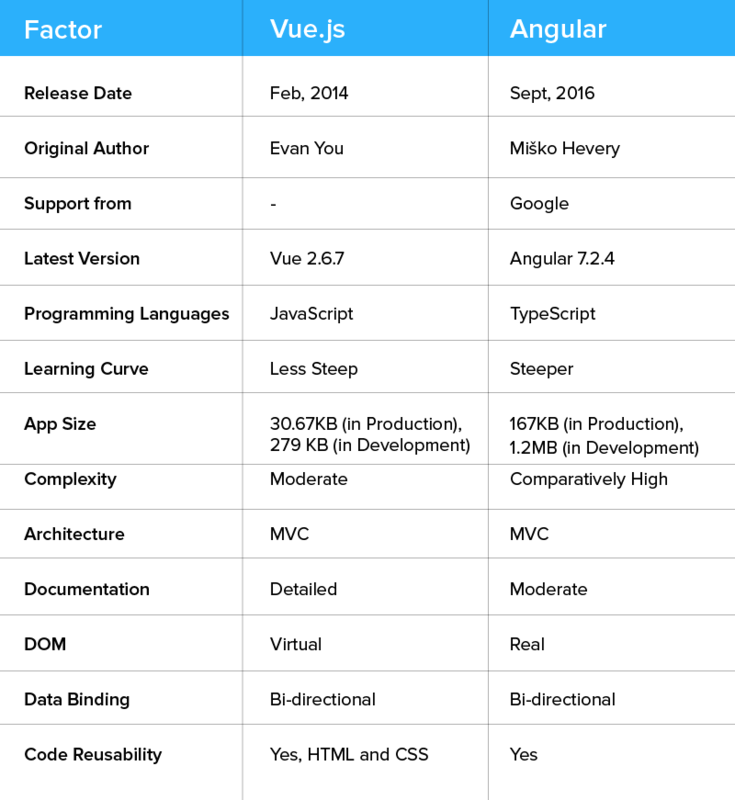 This makes it tough to say which framework is better in terms of popularity – Vue.js vs Angular. To develop an application with Angular frontend development framework, you need to get expertise at concepts like TypeScript and MVC. But, this is not in the case of Vue. Vue.js framework offers inbuilt app templates and higher customization which makes it easier than Angular and React. Besides, Vue.js – being designed by blending Angular and React – makes it easier to bring Angular or React-based mobility solution on Vue platform. Another factor that influences the decision in JS framework comparison is architecture. While Angular implements MVC (Model-View-Controller) and MVVM (Model-View-ViewModel) for creating dynamic websites and web applications, Vue primarily focuses only on the ViewModel and shows limited data. This makes Vue.js become inferior to Angular in the development world. Since Vue.js has been developed much later than various other JS frameworks including React and Angular JS (the earlier version of Angular), it is much simpler than Angular in terms of design and API. In other words, Angular comes with a much higher complexity than Vue.js in the development arena. When you look at scalability as the deciding factor in Angular vs Vue, the former leads the competition. This is because Angular has a proper modular development structure while Vue.js employs template-based syntax, which reduces the reusability of code in large-size apps. Though the recent Angular versions have traits like AOT compilation and tree-shaking which reduces the app size to a considerable rate, an Angular-based app is still not as lighter as the one developed using Vue framework. And since loading time depends heavily on app size, Vue.js mobile app ensures faster loading. Thus, Vue leads the comparison between the two most popular JS frameworks. The next factor that holds the key to choosing the best JS frameworks between Vue.js and Angular is flexibility. Vue.js, when compared to Angular, is less opinionated and provides developers with an official support for a wide range of build systems with no constraint upon the app structure. 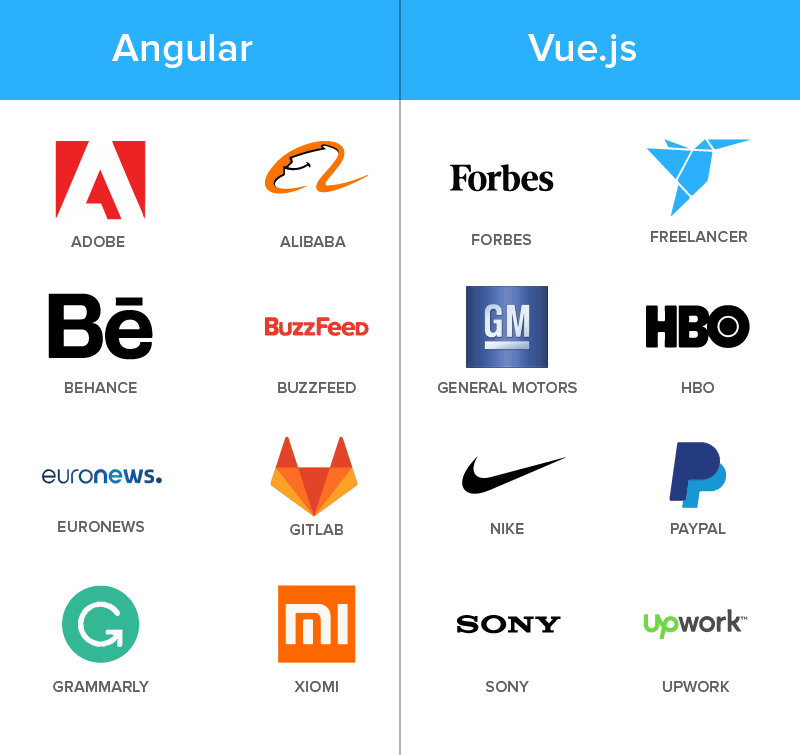 This indicates that Vue.js is a better option over Angular in terms of freedom and flexibility. Just like React, Vue.js also relies upon the concept of one-way data binding in which the UI elements cannot be altered before changing the model state. Whereas, Angular employs two-way binding approach in which model state changes when UI element is changed and vice-versa. While two-way binding seems an easier method, it lags behind Vue.js’s one-way data binding approach in terms of making faster data flow and creating non-trivial apps in less time. Even when the transition from development to deployment is quite easier in Angular app development, it is still required to focus on writing a “good” Angular application. Otherwise, it would be difficult to reap the perks of lazy loading, Ahead-of-Time compilation (AoT), module system and other related features. Whereas, in the case of Vue.js, you can either import anything into your app environment or build a complex local setup (created using Vue CLI) which regulates the code optimizations. You can employ lazy loading of components and even pre-compile the templates already available on Vue.js. This makes the compilation process in Vue.js framework much easier than that experienced in Angular. When taking testing as the prime factor, Angular is a better choice over Vue.js. It has a great testing mechanism and offers multiple tools like Jasmine and Karma that test the complete development code individually. Whereas, Vue.js lacks the right testing guidelines making it tough for developers to deliver a bug-free application. Angular is a web-based app framework considered for creating real-time apps like instant messaging or chat applications. Whereas, Vue.js is suitable for designing lightweight single page applications with an easy interface. Vue.js, unlike Angular which is backed by Google, is driven wholly by an open-source community. Because of this, it lags behind Angular and other JS frameworks in terms of the number of commits and contributors despite having a higher number of watchers, stars and forks on GitHub. Besides, the migration helper tool of Vue.js is not effective for large-scale application due to the absence of a roadmap that concentrates upon versioning and their plans. 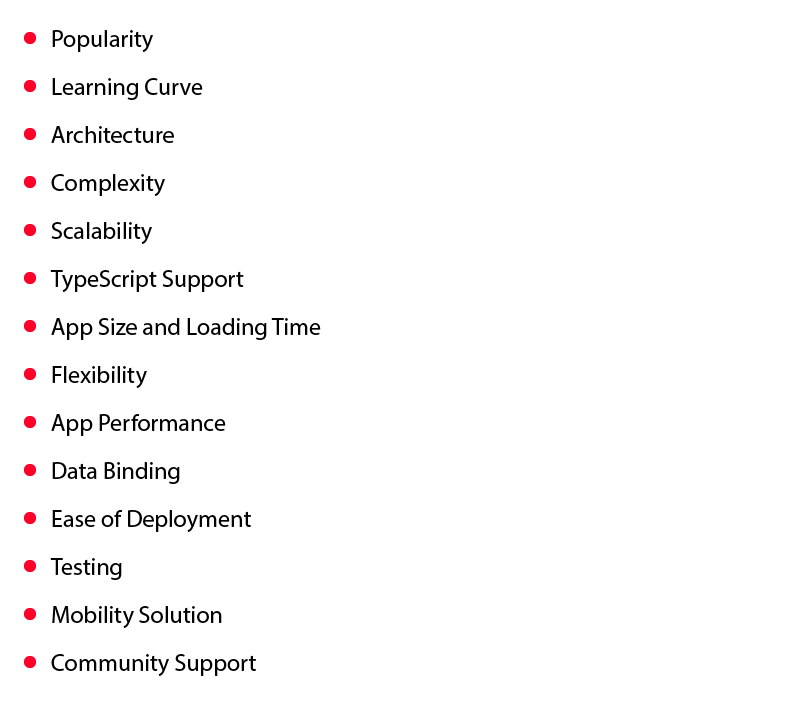 All these factors indicate that Angular is a winner over Vue.js in terms of community support. 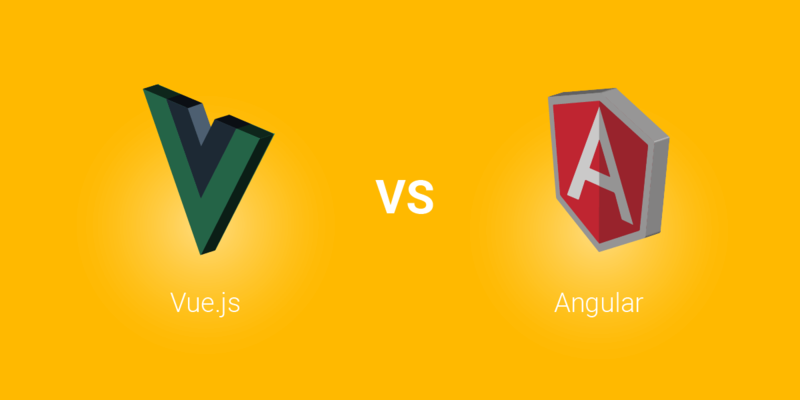 Though the aforementioned factors will help in deciding the right option and leverage maximum advantages, it’s good to look into which JS framework is best for which situation – Angular vs Vue.js. 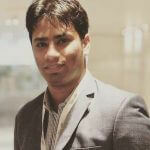 You are developing a large, dynamic and complex app project. You want a real-time application like Instant messaging and Chat app. You require easy and reliable scalability. You have time to learn TypeScript before the project begins. You are fond of Object-oriented programming. You are developing a lightweight and single-page app. You need high speed and performance. Your app project scope is on the small side. You want an earlier entry to the market. You are fond of clear code. Our team, with their years of experience in app development for different business verticals and needs, will guide you in considering the right factors and thus, launching a profitable mobility solution in the market. “Flutter vs React Native: Who is Winning?,�?